Forests make up 65-70% of the land area of Niue, although only about one sixth of this is primary forest. Historically much of the forest was cleared for farming, but in recent years farming activity has reduced and many formerly farmed areas are reverting to secondary forest or scrub. 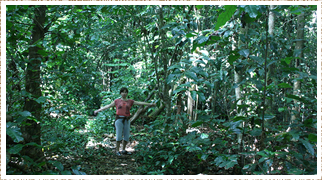 Mature forest has a high, closed canopy dominated by kolivao (Sysygium richii) and kafika (S. inophylloides), along with moota (Dysoxylum forsteri), kanumea (Planchonella torricellensis), tava (Pometia pinnata) and le (Macaranga seemanii). A range of climbers, other trees and ferns form the under-storey and ground layers. Coastal forest has a similar range of tree species with a more open scrub on the seaward margin dominated by salt-resistant trees and shrubs. Niueans retain a close relationship with the forest, which provides timber for building, canoes and some carving, leaves and fruits used for food or medicinally. Three species of forest animal are of particular importance, the uga or coconut crab (Birgus latro), the peka or flying fox (Pteropus tonganus) and the lupe or Pacific pigeon (Ducula pacifica), all of which are hunted for food.